We participated in a Staycation this Spring Break. It was so easy and relaxing. It all started one perfect Sunday at 8:00 AM. 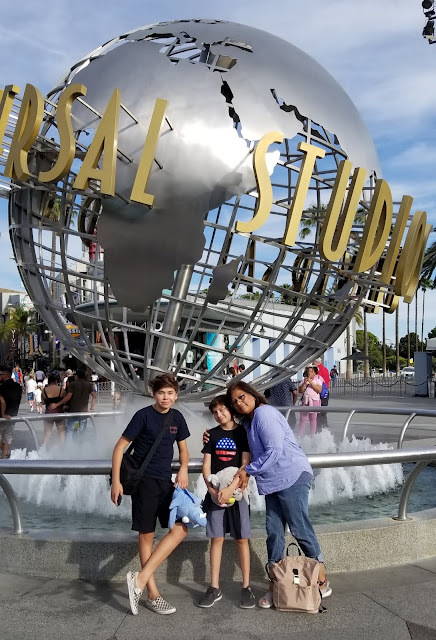 We drove to Universal Studios Hollywood, about an hour away from our home. The kids had never visited before and they were curiously excited to get on the rides. The minute we arrived and parked the car, it was clear, we would have lots of fun. We could see and feel the excitement of season pass-holders as we watched them running to the front entrance. Once we got inside the park, we immediately headed toward the Kung Fu Panda Adventure ride. 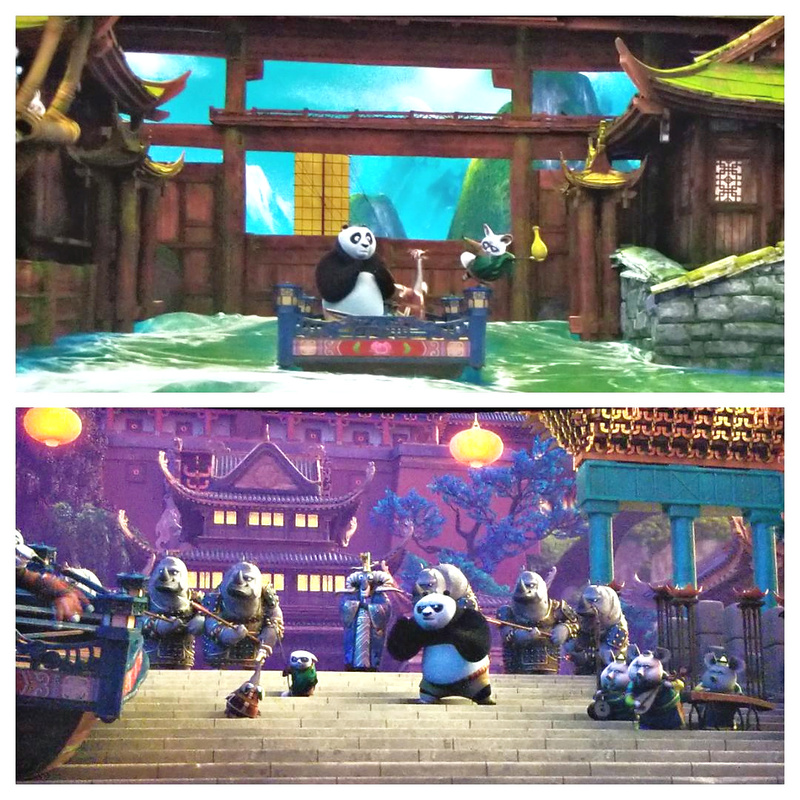 The kids were excited when we used our upgraded Express Pass to enter the Kung Fu Panda multi-sensory attraction. 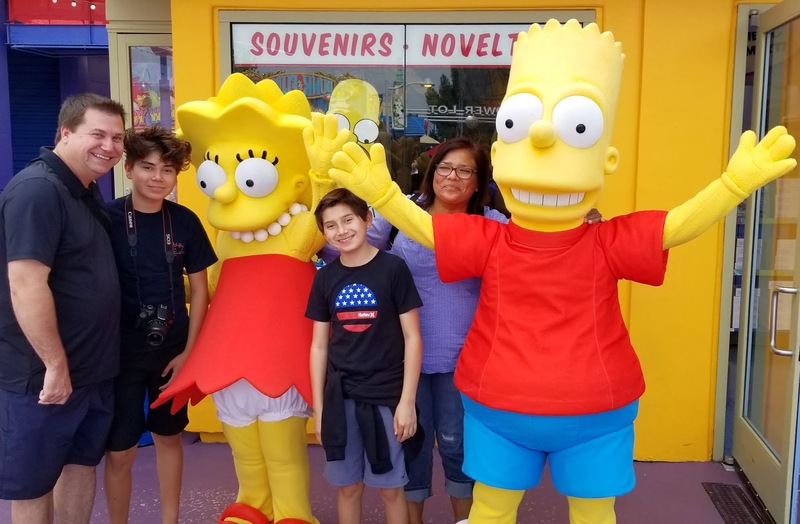 It was our first time visiting Universal Studios and using express passes therefore we did not know what to expect. Quickly, we realized that EXPRESS was the way to go. This benefit is well worth the additional ticket price as we were able to save time in line allowing us to enjoy more of the theme park in less time. We highly recommend your family upgrade your ticket(s) to include the Universal Express Ticket. The ride invites you into a waiting area where Poe and all of his Kung Fu friends entertain you on screens above the main theater entrance. When we entered into the main theater, sat down and started the ride, we got a case of the giggles. The ride hit our funny bones as our seats swished and swayed along with the movie on the screen. The motion made it feel as though we were on a raft riding over waterfalls and fast moving river rapids. Water droplets sprayed us from the ceiling as Poe was guiding us down the rapid river. It was exhilarating. We laughed the entire time. We exited the Kung Fu Panda Adventure ride and headed straight to the Harry Potter Wizarding World. There we splurged on candy, shopped the stores and drank Butter Beer. The Harry Potter section of Universal Studios is extraordinary because it makes you feel as though you are inside the movie. You have to see the picture below to understand what we mean. Our boys jumped on the Flight of the Hippogriff, Universals first outdoor roller coaster. We ended our tour with a stop to enjoy the Frog Choir, watching in amazement of some Wand Magic and taking photos in front of the train station. After taking in the view of the castle and all other things Harry Potter, we briskly walked to the Despicable Me Minion Mayhem ride. My husband and I realized we had turned into teenagers as we were pointing and planning the next ride we would all enjoy. Minion Mayhem was my favorite because I really enjoyed the series of Despicable Me Movies. For this ride, we needed 3-D Glasses as we went on another adventure with Gru and his Minions attempt to turn us humans into Minions to help with his new thievery plan. Our visit continued with the classic and great experience of the Universal Studios Tour featuring a tram tour of the back lot where you can experience movie making at its finest. 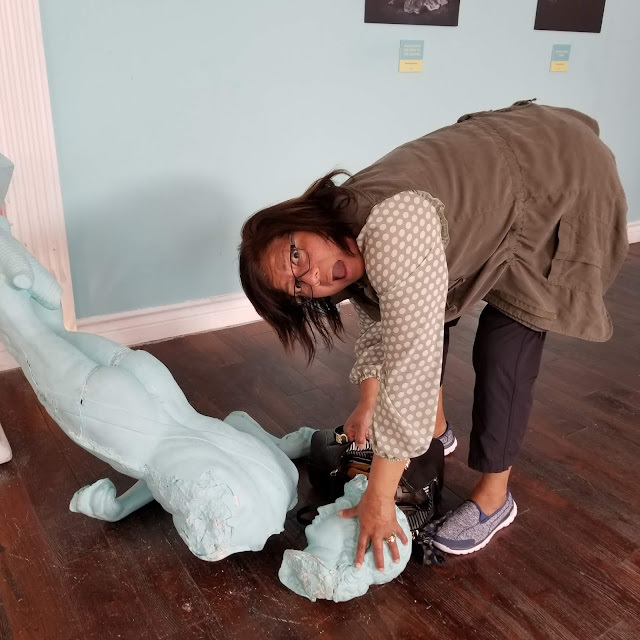 From an earthquake simulation to a speed expedition with Fast and the Furious, the Bates Motel of Psycho and Jaws, the tour gives you a detailed experience in movie making. Our day rounded out with taking rides on The Simpsons Ride, joining Optimus Prime and Bumble Bee for a fight against the Decepticons on Transformers the Ride 3D, a thrill ride on Revenge of the Mummy, experiencing movie magic in the Special Effects Show and rounding out our adventure at the highly exhilarating and absolutely adventure show, Waterworld! 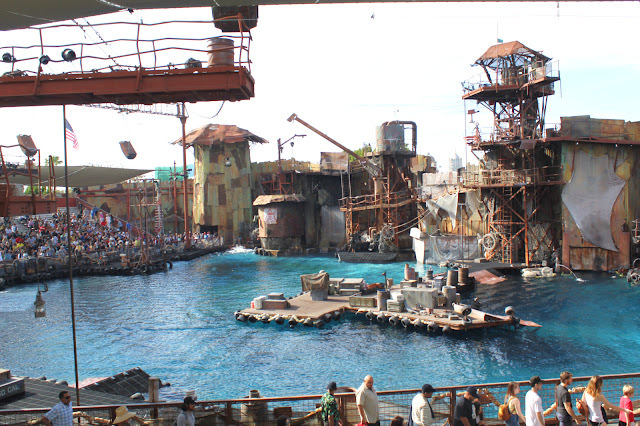 Unlike any other theme park, Universal Studios brings the fun to you with a completely different and exciting spin to adventure. The theme park is spread out over a very large area. We walked over 17,000 steps or the equivalent of 8.7 miles the day we visited. Honestly, there was so much to see and do, we really didn't notice until we looked at our step counter during dinner at Universal City Walk. The City Walk has a huge selection of eateries including Pinks, Panda Express, Pizza, Voo Doo Doughnuts and greats like the Hard Rock Cafe and much more. Retail stores line the City Walk for those that need to get their shopping in. Universal Studios has excellent and abundant parking structures and best of all, you can get a great evenings rest with the nearby Sheraton and Hilton Hotels. 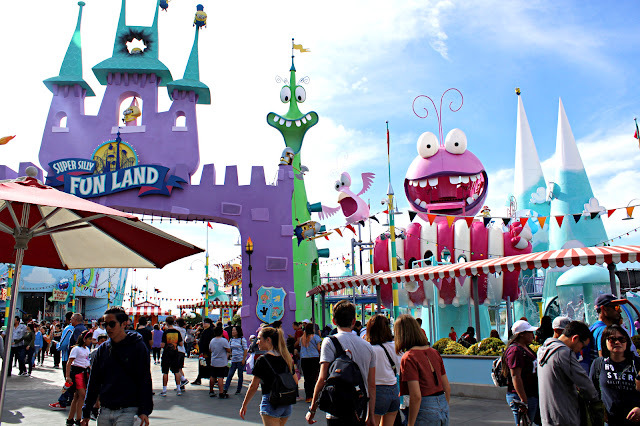 Enjoy one of the best vacations ever with a Staycation at Universal Studios Hollywood. Disclaimer: All thoughts and opinions are all our own. 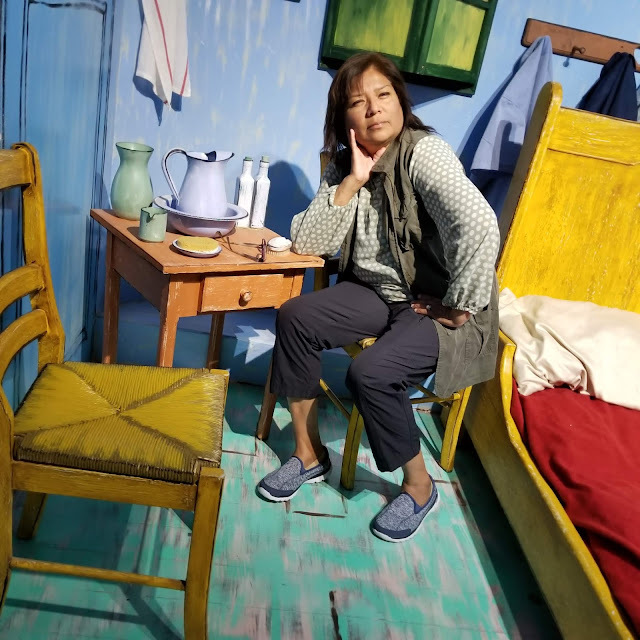 Travel, Food and all other incidental items paid by Field Trip Mom. We were invited as part of media. We did not receive any compensation. Are you looking for an amazing Brazilian BBQ Steakhouse, also known as a Churrascaria, that won't break the bank? If you are a meat eater, you are in luck because we are about to embark on a foodie's dream. Even if you have a family member or friend who is vegetarian, you can feel good about your restaurant of choice. 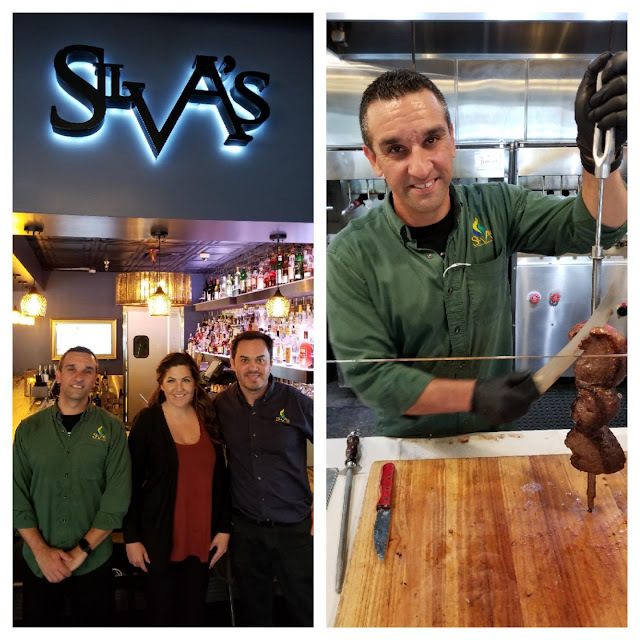 That place is Silva's Fresh Eatery & Churrascaria! Come one, take a tour with us. 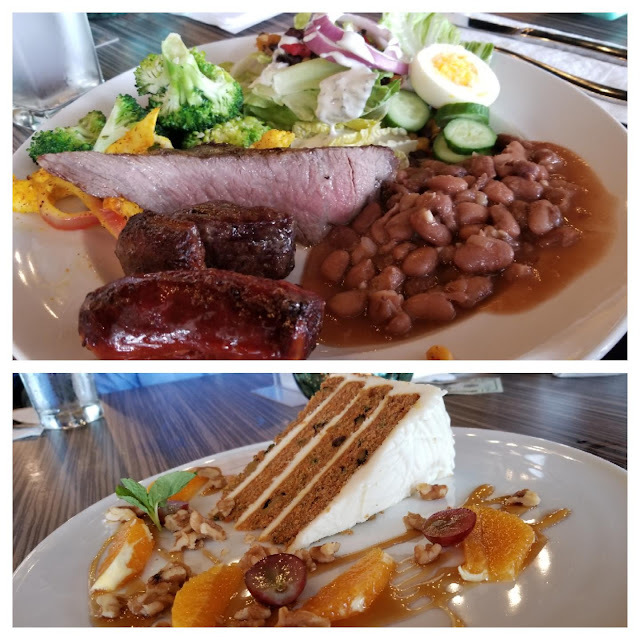 Silva's Fresh Eatery & Churrascaria has been open for about a year and brings fresh and delicious to the table until you throw in the towel. Let's start with my favorite part of this experience, the Churrascaria. Behind the buffet counter, you will find the Master Chef awaiting your selection of deliciously cooked meats including sirloin, veal, chicken, ribs and sausage. The chef pulls the rack of meat off the oven, brushes it with the restaurants secret blend of spices and slices it to perfect right before your eyes. The juices of the meat are running as the chef carefully slices your serving. Don't worry, pick 2, or 3, or maybe a sampling of all of their meats because these plates can hold enough for an army. And for you meat eaters like me, don't worry, there's another fresh plate with your name on it because Silva's Fresh Eatery & Churrascaria is all you can eat. Now, we can't forget the most important part of the meal because no human can live by meat alone. Let's talk about the fresh part of this eatery. Made from 100% Organic, Locally Sourced and Locally Grown vegetables, the side dishes are a meal in itself and will be the delight of your vegetarian family member or friend. Silva's has everything one could imagine. As you walk up to the start of the line, there are a host of salad options and ingredients to custom make the salad of your dreams. From lettuce, broccoli, red onion, hard boiled eggs and more. This is a salad bar dream. Next you will round the corner of the buffet to find amazing Brazilian dishes that compliment every plate regardless of your dietary needs. Cheese rolls, beans, Brazilian beef stew, roasted salmon, curry cauliflower, rice and so much more. You have to try just a little of everything on the first plate but save room to go back to enjoy your favorites. For me, it was hard to choose a favorite, I loved everything! Finally, let's get to the best part, the price. 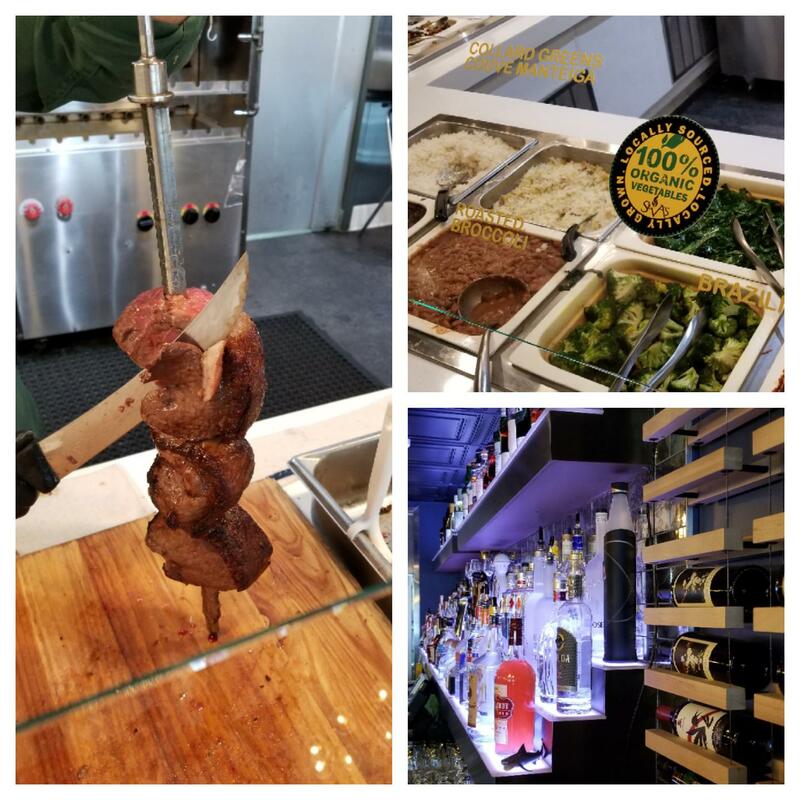 Silva's Fresh Eatery & Churrascaria is reasonably priced and nearly half of the other Brazilian BBQ steakhouses in the area. 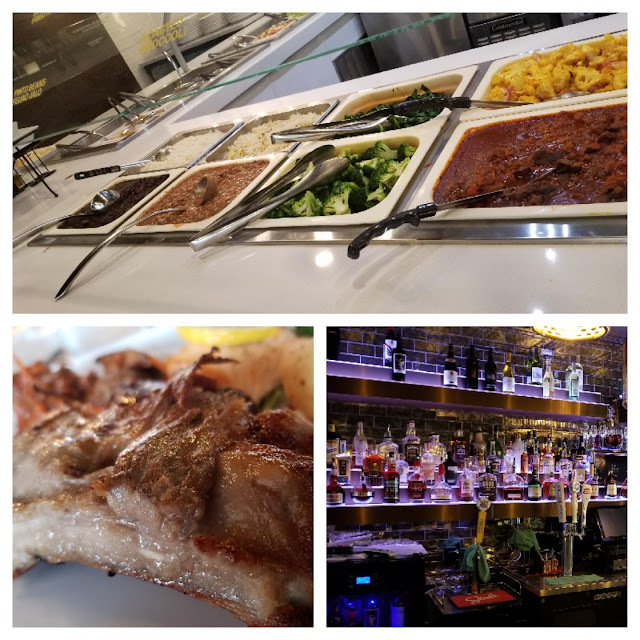 With a full bar as well as kitchen menu that offers a wide range of alternative meal options in case you don't have a stomach for all you can eat service. The restaurant has a beautiful dining area and the staff was amazingly nice. Everyone from the front of the house to the back were focused on the most important piece of the business...their customers. Great service, excellent food and prices that won't break the bank. Silva's Fresh Eatery & Churrascaria is located at 3672 S Bristol St in Santa Ana, CA. The restaurant is on the north side of the strip mall close to the LA Fitness. We recommend exiting the 405 Fwy at Bristol, travelling north on Bristol. At McArthur Blvd, make a U-Turn and pull into the shopping center just past Chase bank. The restaurant faces McArthur Blvd. Although a bit hard to find in the shopping center, the food is well worth finding this amazing eatery. They have plenty of space for large parties however it is recommended you make reservations for Friday, Saturday and Sunday. 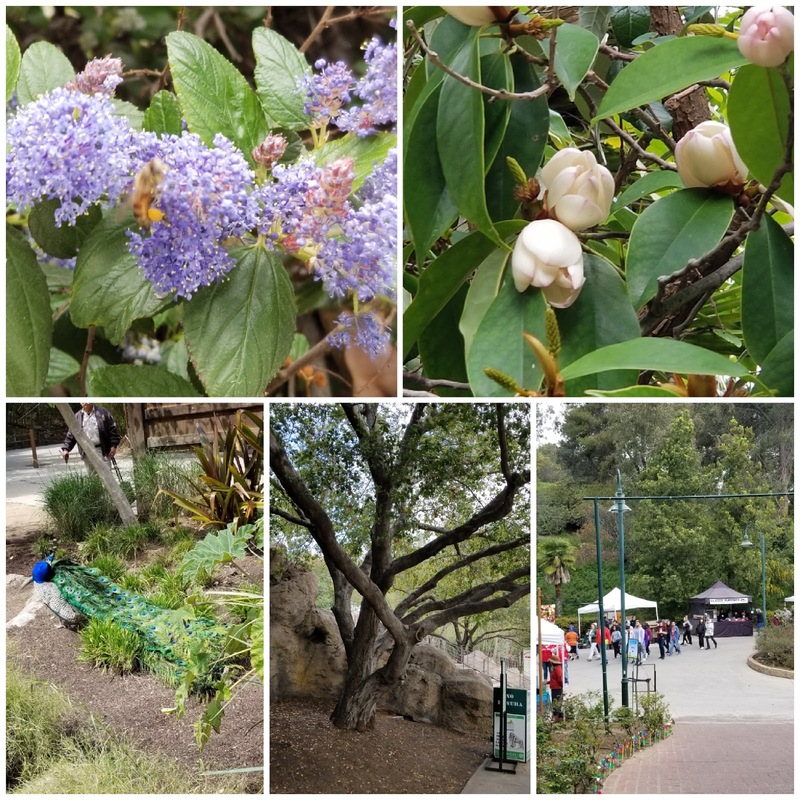 At the end of March, we visited the Los Angeles Zoo and Botanical Garden. It is one of our favorite places to visit during Spring because it is peaceful and full of beauty. The first exhibit we saw was a lovable seal named Ziggy and his friend. Their home is right near the Zoo entrance. As we approached the glass the seals began to come closer in our direction. Standing there we could see how playful they were being with one another. It was relaxing to watch them play. For a few moments everything is forgotten and your mind wonders off into the beauty of nature. After we finished visiting with Ziggy, we ran towards the Flamingo exhibit. There, we all pretended to stand like a flamingo on one leg. It is very funny to try that pose. These flamingos are, of course, the yoga masters of the zoo and they make it look easy. Next time you visit the zoo try standing on one leg without falling or shaking while sticking your head in the ground. 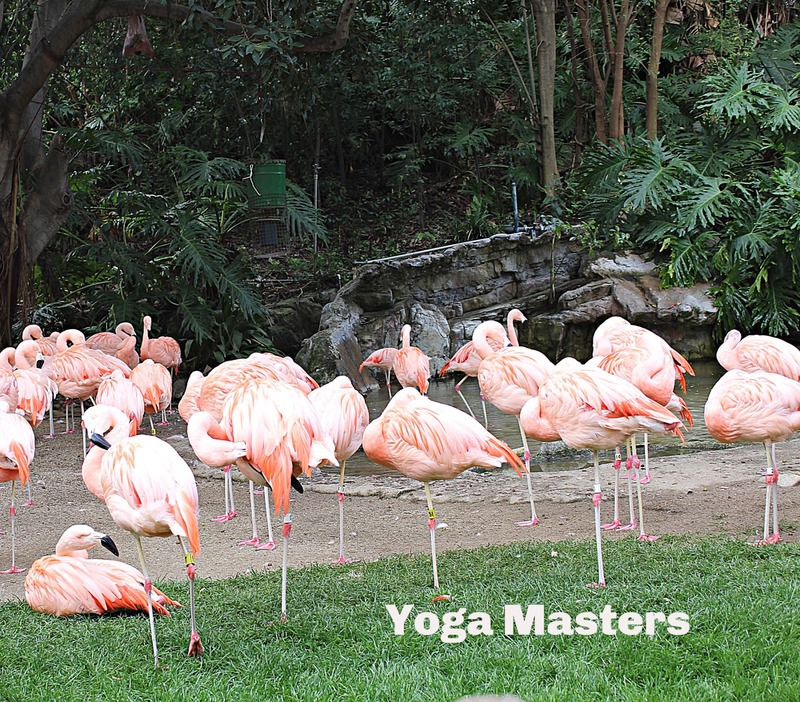 Now you see why we call them Yoga Masters. 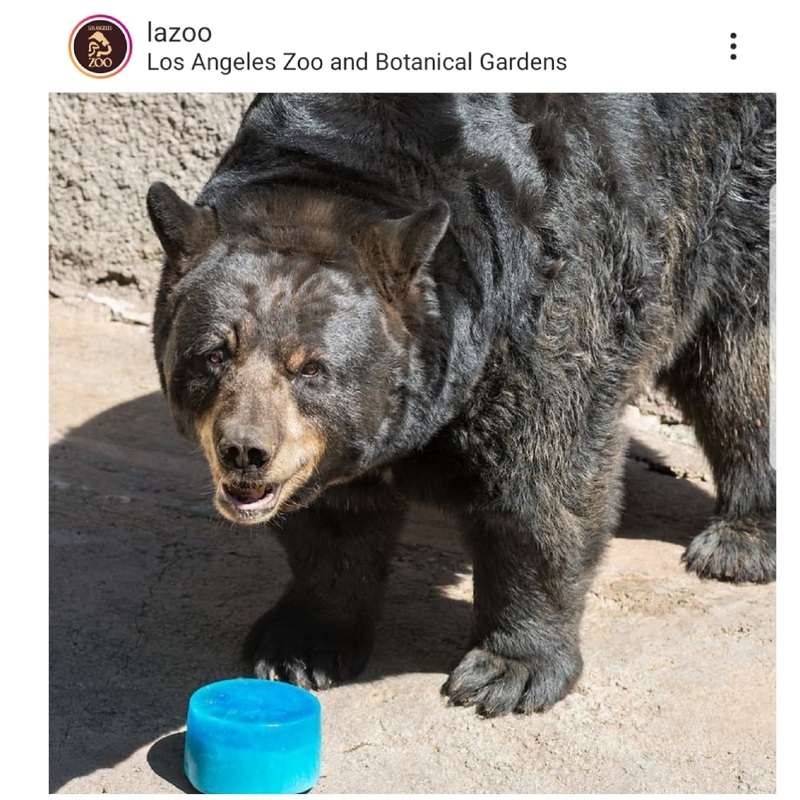 The next adventure was going to visit the American Black Bear who lives in the back of the Zoo. 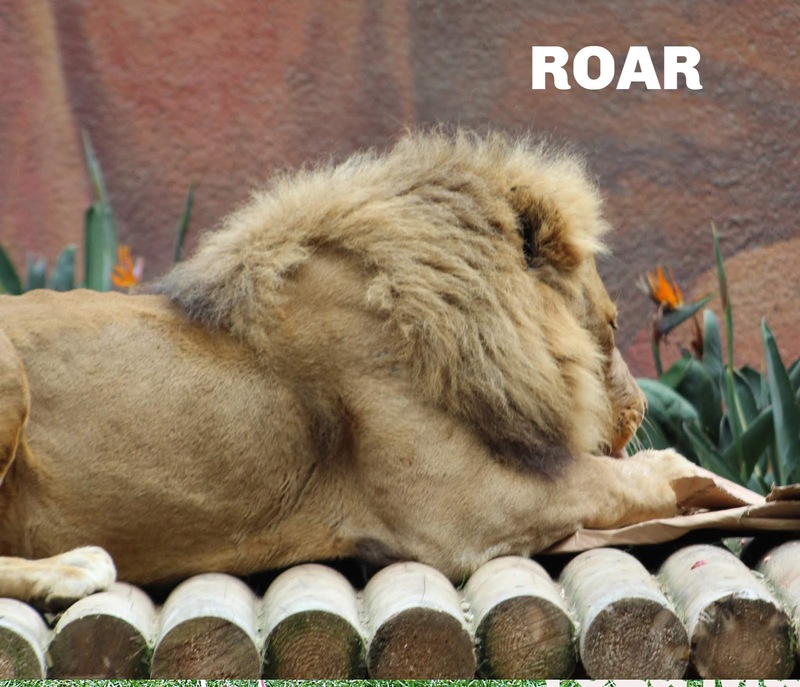 He is an animal that we admire because he is so adorable from far away but very dangerous up close. (Don't ever mess with bears of any kind!!!! ) This time around, the bear was just sleeping, tucked away near by. We could see his paws and the top of his head that stuck out from behind a rock. We said our good-byes and told him we would return soon and waved. The next place we went was to see the lions. WOW! They were eating lunch when we arrived. The kids were amazed at the powerful jaws they have for eating their food. YIKES! Our boys loved every minute of the visit with the lion. Around the corner from the lions was the Giraffe exhibit. Across the way was a little cafe where you can sit and eat while watching these supermodels of the zoo. The wind picked up a little and it felt like a welcomed hug. We were hot from all the walking so sitting and eating while a gentle wind passed through felt perfect. As we made our way back to the front of the zoo, we stopped and visited more animals, birds, reptiles and botanical gardens. We enjoyed the trees and the gentle breeze that flowed through the zoo. It all felt like the perfect day. 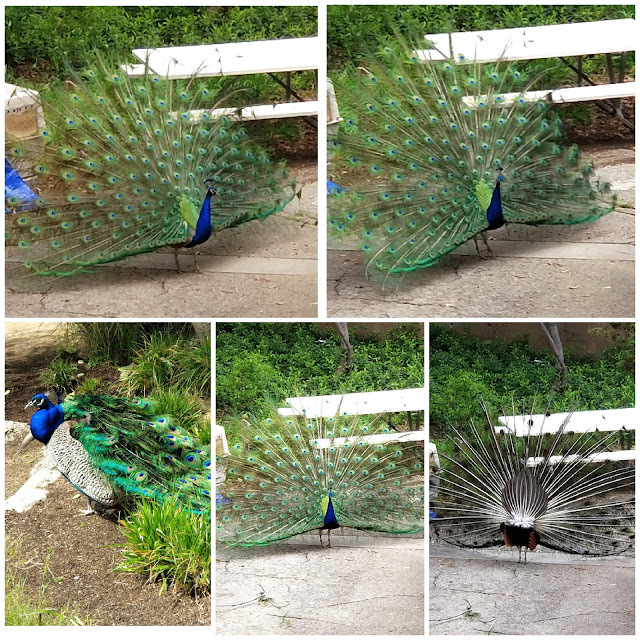 Just around the corner, among zoo visitors a beautiful peacock roamed freely. He loved posing for pictures as long as we kept our distance. He was the perfect zoo ambassador. The kids named him, "Freebird". Freebird gave us several picture opportunities before leaving public view. "Pollination Celebration” acrobat show at 1 and 3 p.m.
Green-screen photo booth experience from 11:30 a.m. to 2:30 p.m.
Roaming bee and butterfly puppeteers, 11 a.m. to 3 p.m.
Disclaimer: All thoughts and opinions are all our own. We were invited as media to visit the zoo. All travel expenses were paid by Field Trip Mom ( meals, gasoline, tips for gratitude and fees for activities that are not included with admission.) No compensation was received. When our kids were little, my husband and I would read them stories at bedtime. Some of our favorite books were funny and memorable. The titles were, "If you give a mouse a cookie? ", "Horton hatches an egg." and many more. We would make funny voices as we read the books. As the kids grew-up, we started having them read to us. 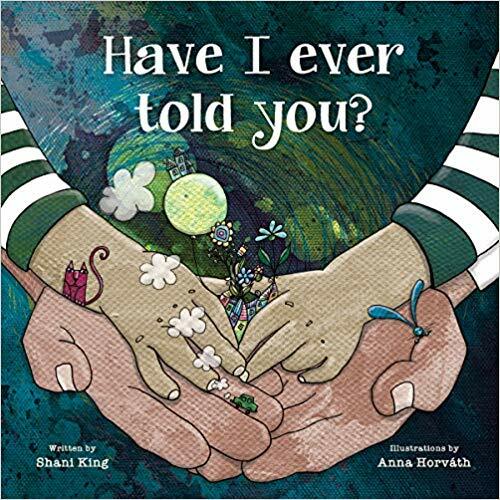 One book that my son is reading to us is "Have I ever told you?" by Shani King. You are probably wondering why our son is reading this to us? We have the kids read silly and funny books to us to keep the magic of reading. Of course, our kids are now reading more intense books that discuss history, politics and math. Some of their current reads are very boring but necessary for their education. Having our kids read to us books like, "Have I ever told you?" helps to make family time silly and yet educational. As they read, this book actually sparked conversation about using uncomfortable words. The book talks about doing the right thing and being brave to discuss any topic they have questions about. As a result, our boys wanted to discuss why adults and some preteens / teens use foul language. We engaged in some very interesting and insightful dialog after reading the book. This book has a great message of be kind, thoughtful and you can achieve anything you set your mind to. The pages are filled with great reminders for both children and adults of what this world needs more of everyday. We hope that this books captures your heart just like did ours. 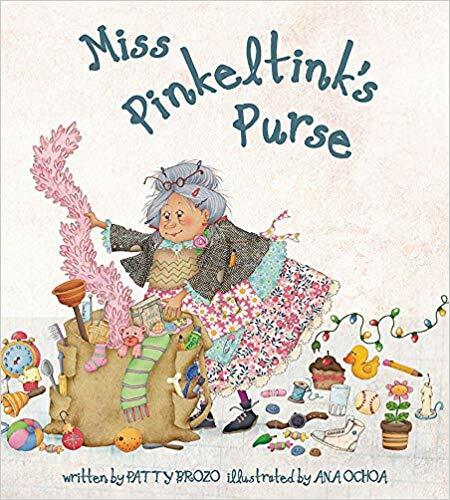 Amazon says:"This little book holds the message of dignity that every child on this earth needs to hear: You are loved. You matter. You make me smile. You make me the happiest person in the world, just by being you." We are also reading, "Miss Pinkeltink's Purse." A story about a lady with no home but a big heart. A little girl will change her situation. "Nobody is too small to do something BIG!" Another great book to read with your kids and teach compassion towards others. Taking care of your skin includes your beautiful hands. A few months ago, I had a real scare. I found myself at the Dermatologist office because the skin on my hands and legs had burns. Clearly, I was allergic to some thing I was applying to my skin or a food I was eating. My beautiful legs and hands were damaged. The first thing my doctor asked was if I used sunscreen. I do but only on my neck and face. She was disappointed to hear that I did not care for my hands and legs the same way as my face and neck. In that moment, I realized that taking care of my health included my skin as well. I left the doctors office with a list of things I needed to do and a prescription for ointments. I have to admit, I cried all the way to the pharmacist because I never saw my skin so fragile as that day. The next day, I went looking for gloves that would cover the burns on my hands. I went to several stores but found nothing I could really use everyday. I did find sweaters with attached finger-less gloves. It worked for a little while but I really needed something detached for when I went to get my nails done or driving. I was desperate to find something that would fit my hands. Voila, I was offered to test ManiGlovz. Finger-less gloves that protect your hands from the UV and LED Rays. I felt so relieved that I finally had something I could use to protect my hands while I was going through this horrible medical problem. ManiGlovz come in many colors and styles. They are easy to carry in your purse. The fabric is soft and it feels cool on your skin. Reading the story that a dermatologist created the gloves to protect the hands was comforting news for me. 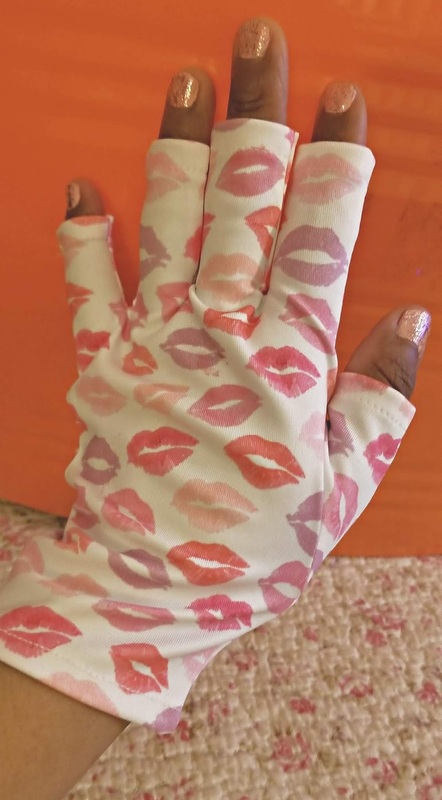 These gloves made me feel a little better about myself because it covered the damaged skin on my hands. The bonus to wearing the gloves was that friends and co-workers thought I was being fashion forward. I received many compliments on them. It really helped to bring my spirits up. This experience has opened my eyes to better caring my skin. 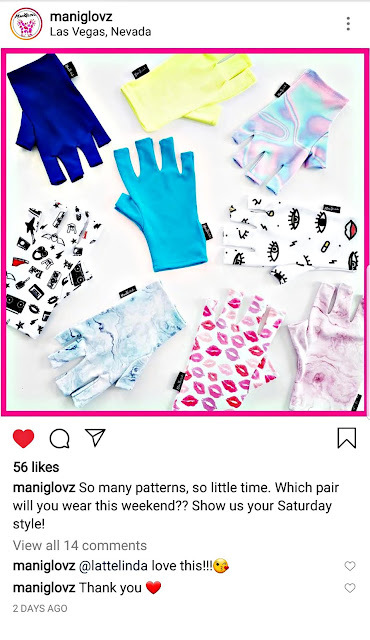 I will from now on make every effort to use ManiGloves to protect my hands from harmful elements. I really recommend that you consider taking care of your skin with more love and kindness. You are worth having excellent skin. Lent, Mardi Gras and Fat Tuesday events. Lent will soon arrive. For many, it is time to decide what vices we will focus on during the preceding 40 days in honor of our beliefs. Many people will give-up chocolate or diet sodas. Others will try to stay in prayer, helping to heal their health or their relationships. Before the 40 day journey begins, we will celebrate with fatty foods, fuzzy drinks and colorful parades. Mardi Gras, in Southern California, is an experience everyone should take part of if you can't make it to New Orleans to celebrate. Here are a few places you will want to visit before Ash Wednesday. In advance of Mardi Gras, the New Orleans Traditional Jazz Band takes the stage for an afternoon concert inspired by the exhibition New Orleans Second Line Parades. The Los Angeles-based band includes members from New Orleans who will pause throughout their performance to discuss the history of American music since 1803 (the year of the Louisiana Purchase) and leading up to the Swing Era. 2–4PM Fowler Families presents Little Mardi Gras with the New Orleans Traditional Jazz Band Follow the band in a lively procession into the Fowler’s Davis Courtyard, where jewelry-making and mask-decorating activities will be available to children of all ages from 2–4pm. This exhibition of 40 color portraits by Louisiana-born photographer, Pableaux Johnson, documents members of African American Social Aid & Pleasure Clubs in New Orleans. These neighborhood-based associations are renowned for elaborate attire worn for Sunday brass band parades known as Second Lines. Saturday & Sunday, March 2nd - 3rd & Fat Tuesday, March 5th. L.A.'s favorite Mardi Gras celebration returns for its 30th year straight! Join us for down-home fun and the finest New Orleans and Zydeco music, strolling parade bands, activities for kids, bead-throwing, and much more! Tuesday, March 5 - Buy Tickets ahead of time. “Laissez les bons temps rouler!” is French for “Let the good times roll!” It’s one of the most popular sayings during Mardi Gras. 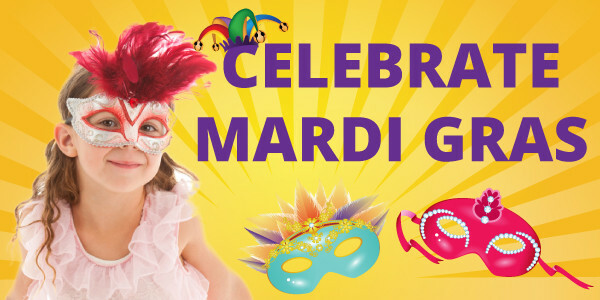 Join us at Pretend City and let the good times roll in our own Mardi Gras celebration! Sing, dance, and bake your way through the museum and end the day with a festive parade down our city streets. Purpose Behind the Play: Perceptual motor skills and movement and social-emotional development. Smart Art (Art Studio-Times Vary): Today in the Art Studio children will be able to decorate cardboard box floats to use in Conga line dance party and going home Parade. Family Fitness Fun (11:30 am): No Mardi Gras celebration is complete without fun jazzy music to dance to the beat. Join us in Orange Plaza for a festive conga dance party! Cooking Up Culture (3:00 pm): Visit the Real Café to learn about the traditional Kings Cake and the meaning behind it. After our discussion, we’ll sample some Kings Cake. Will you be the lucky one to get served the special surprise? Carnival for Kids (4:30 pm): From the floats to the beads your children will enjoy participating in their very own carnival which will include a dance party. Children will be designing cardboard box floats in the art studio throughout the day and donning them during our going home parade! Grown-up Tip: Try a new Cajun recipe at home tonight! Make a grocery list with the ingredients you will need. At the grocery store, let your little shopper find the items on the list. Including your children in choosing these new food items will make them more likely to eat them at home, thus getting your child to try new foods, a challenge many parents struggle with. The annual LONG BEACH MARDI GRAS at Shoreline Village and Rainbow Harbor returns on Saturday, March 2, 2019! Join us for live music, food specials, and more 12pm – 5pm throughout Shoreline Village, and of course, our annual MARDI GRAS PARADE at a new earlier time – 2pm! One of the largest annual free community events in Long Beach, California,#MardiGrasLB invites you to join thousands of cheering revelers as Shoreline Village hosts an afternoon of music, art, festivities, and more. Join folks of all ages in dressing up, dancing, and making merry along Long Beach’s beautiful Rainbow Harbor! Disclosure: Keep coming back there are more events that will be posted this week. Stay tuned! Museum of Selfies in Hollywood, California. 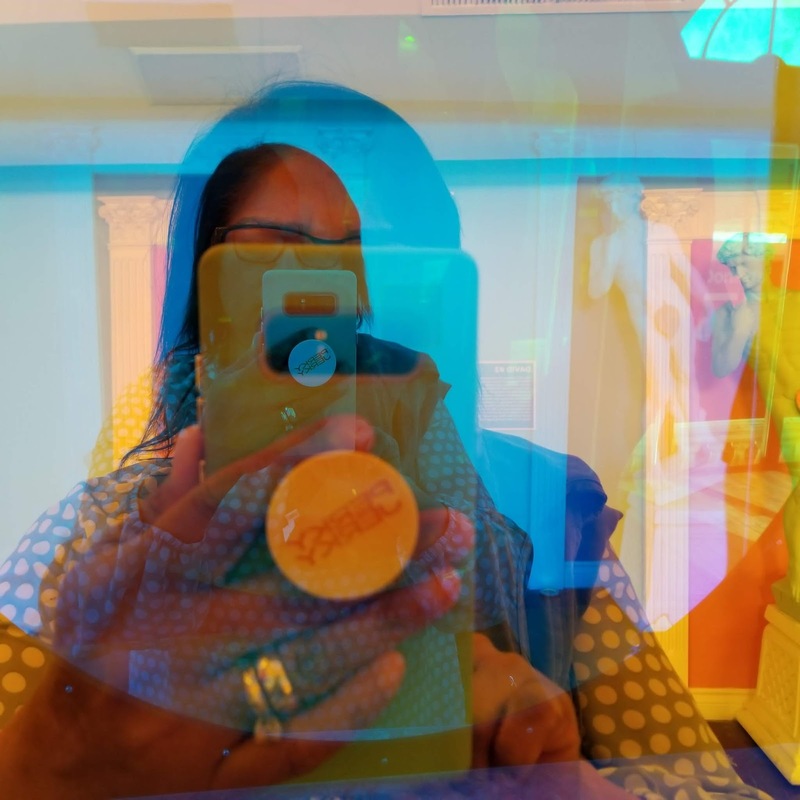 Get creative at the Museum of Selfies in Hollywood, California. The museum is filled with approximately 30 interactive displays that allow you to capture your vision through a camera. This is a great place for teenagers and families to make some fun memories. 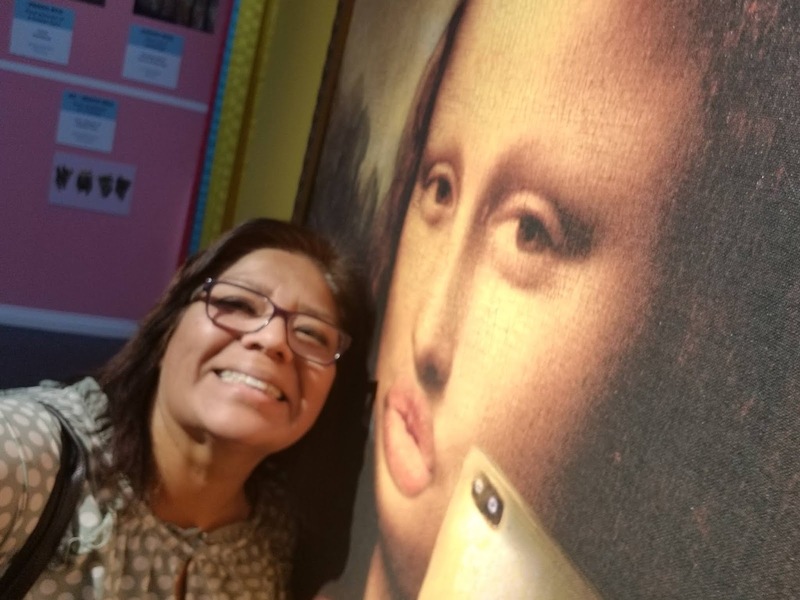 We visited the museum on a Sunday morning and played around taking a variety of selfies. We captured some really silly and jaw-dropping pictures. The museum is a great place for you and your family to play with your imagination. They encourage touching and getting in touch with the props and displays. This is a hands-on experience. Below you can see me pretending to be inside a very famous painting. Can you guess which one? Through our experience, we noticed that there were visitors with bright color clothing, hats and costume jewelry. We could see that some of the visitors had planned ahead their wardrobe to make it more entertaining. It maybe something to consider, if you visit the museum. You can buy tickets online or at the location. There are discounts through Groupon or check out the Hollywood Chamber for a 20% promo code. Disclaimer: This is not a sponsored post. Images and post is property of Field Trip Mom. Pick your own oranges this weekend. 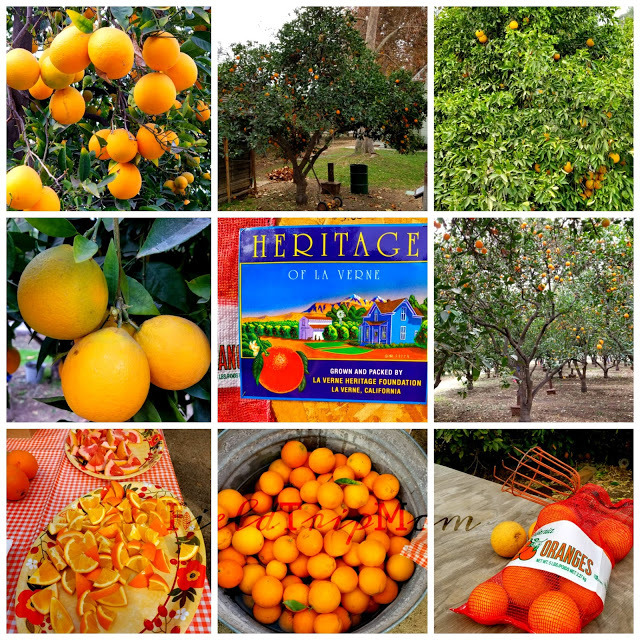 Pick your own oranges in the city of La Verne opens this weekend. This is a small orchard that has been around for many years. This orchard is only open to the public a few days a season to pick fresh oranges. We go every year and bring home several bags of their famous fruit. The kids love to get outside and pick their own sweet treat. Bring cash as they do not accept credit or debit cards. We suggest to bring at least $40.00 dollars because they also sell other delicious products. Wear comfortable clothes and shoes for this adventure. Don't wait, this orchard sells out fast. 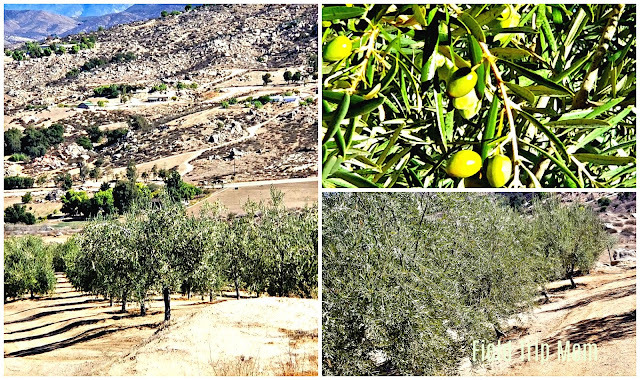 Award-winning olives are grown here in Southern California. Southern California is a beautiful state filled with many farms and orchards. This past November, we had the opportunity to tour Macala Orchards during Pomegranate season. 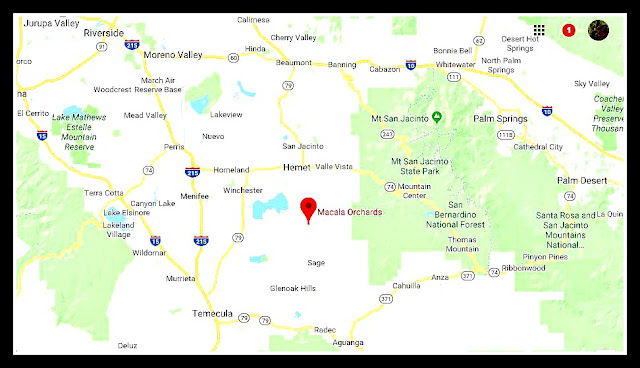 Macala Orchards is located in Hemet, California, approximately 75 miles from South Orange County. It is one of two farms known for Olive Oil and is the only Pomegranate farm we could find near Orange County that would allow tours. 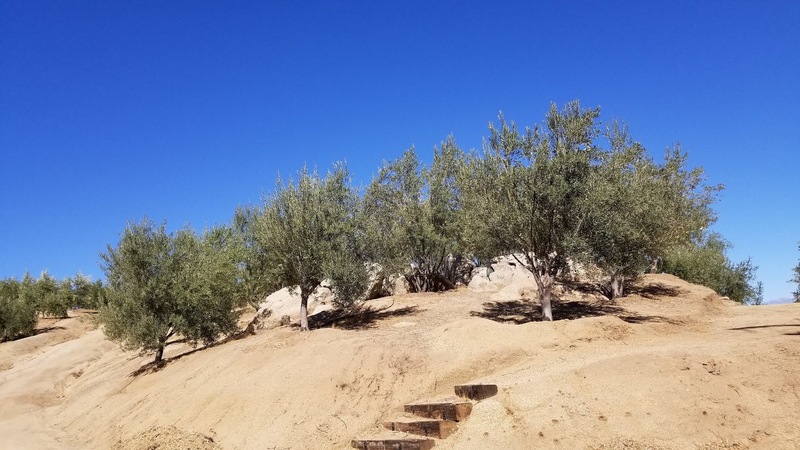 The twenty-acre orchard is filled with 500 Olive Trees, 172 Pomegranate Trees, 35 Guava Trees, 9 Fig Trees and an herb garden. It is a peaceful place, far away from the city lights and heavy traffic. Perfect for growing award-winning olives! 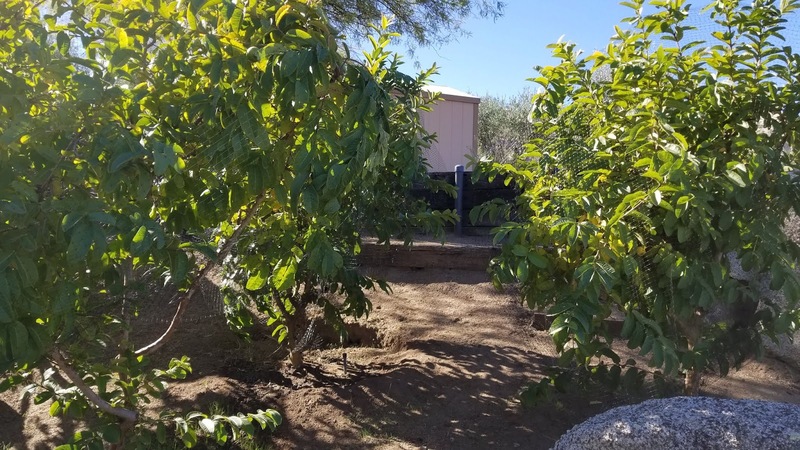 Interested in camping in the orchards? Macala Orchards is host to several tent camping spots with beautiful views and amazing star lit nights. How we arranged a tour: Months before the pomegranate season began, we reached out to the orchard. Nina Morton, Vice President of Macala Orchards, replied to us with their tour availability. To schedule a tour or find out more information about the orchard, you can contact her at nmorton@macalacompanies.com. 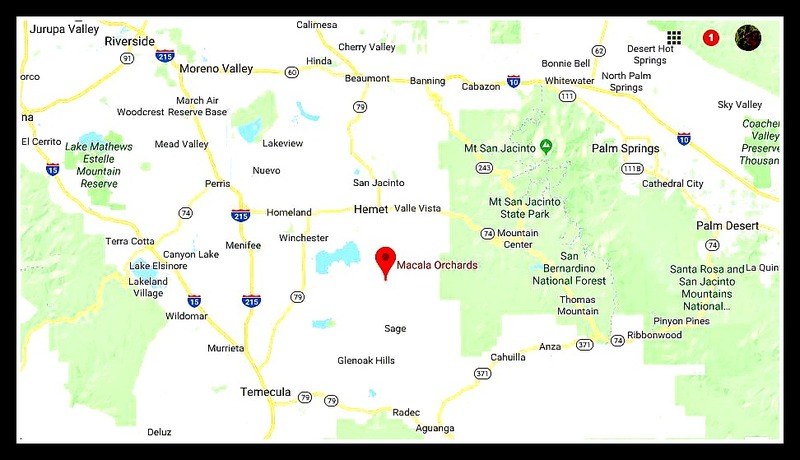 Macala Orchards is located at 40785 Benji Ln, Hemet, CA 92544. The orchard is not too far from the San Jacinto Mountains. What we experienced: The Orchard owner, Rich, gave us a tour of the orchard, where we sampled a few guavas, their cold pressed olive oil and some pomegranates. It was a week before their olive harvest and we could see the beautiful olives taking in the sun. Among the beautiful orchard, we explored their tent camping sites which gave us a real sense of peace and serenity. As we visited each section of the property, we could see the love and care that they place on their trees and campsites. Love lives at Macala Orchard. Why you should visit: The twenty-acre orchard is very family friendly and allows for tent camping on site among the gorgeous olive trees. Reservations for your tent camping spot can be made online via the Hip Camp website. 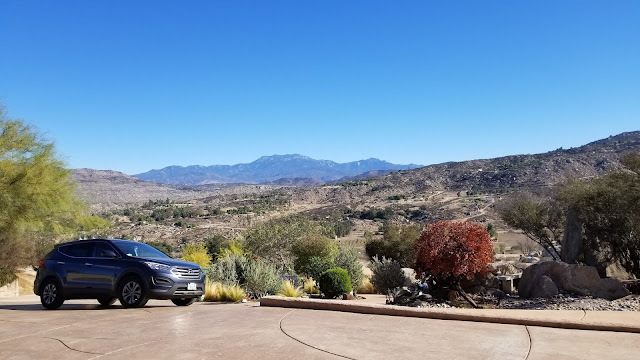 While you camp, you can enjoy the San Jacinto Mountain Views and the fresh air. The entire experience was very special and unforgettable. When we returned home, we had a box full of pomegranates and a bottle of their finest award-winning olive oil. We ate a big box of pomegranates all by ourselves. They were so tasty and juicy. 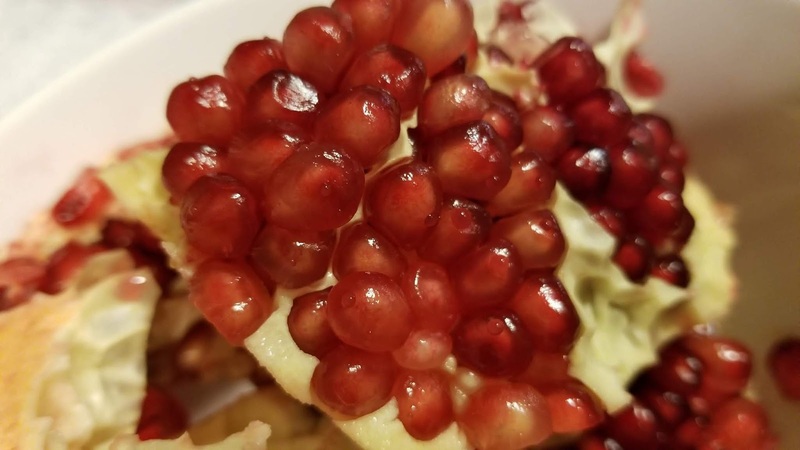 We will certainly buy more pomegranates next season and will be ordering more olive oil on their website soon. Source: Macala website -"Award-Winning information: Macala Sicilian Blend EVOO and Macala Itrana Blend EVOO both received a Gold Medal in the OC Fair 2018 California Olive Oil Competition! Additionally Macala Sicilian Blend EVOO received a Silver Medal from the California Olive Oil Council in their Annual Extra Virgin Olive Oil Competition!" Sutter Buttes Olive Oil Co.
Disclosure: This is not a sponsored post. All meals and foods were paid by FieldTripMom. Sources: California Olive Oil Council, Visit California and California U pick farms. Please call ahead before visiting any location as times and dates are subject to change.